Rory McDonald, owner and director of Hi-Line, the specialist caravan haulage company, talks to Hugh Sorrill about the particular challenges in his sector. Since before Easter, Rory McDonald has been a busy man. His business is less dramatically seasonal than once it was but there are still high spots in the run-up to holiday periods. Rory’s company, Hi-Line Transport, hauls caravans, although it is too narrow a word for the wide, indeed palatial, mobile homes on his trucks. As leisure parks and resorts gear up for the influx of holidaymakers, their demand for new caravans goes up dramatically, and when the new ones are taken in, the old ones have to be taken out. “There are two categories of caravan we carry,” says Rory, “Those for the leisure industry and those with a residential use. We move new and used, in fact we're involved in every type of transport in the caravan industry, from trailer tents up to the 60 x 20 units that come in two halves – every type of caravan and every type of customer. We also deliver to various docks for shipping to France, Spain and Ireland. Whereas most hauliers have to keep within weight regulations, caravans are comparatively light and fragile. Their widths and sometimes their lengths bring them within abnormal load regulations, presenting more complex movement problems than general haulage. It’s a skilful job moving these things around the country,” says Rory. “Overhanging trees, for example, can rip the side off a caravan and traffic calming measures can make a road too narrow to go down. But it is also an enjoyable job – you’re going to holiday resorts, to the dales, to the coasts. 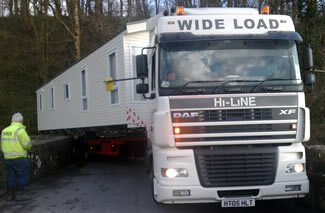 With all the variables in the type of caravans to be hauled, the routes and the access, Hi-Line has to be flexible. Rory has ten different sizes of trailers and rigids to cope. All with 17.5” wheels, they are all bespoke or specially modified to reduce load height: step frame trailers have had their neck portions reduced in thickness to allow caravans to be pulled up all the way and flat beds have had adjustable wheel depressions installed. More important perhaps than the physical obstacles of the job are the legal ones. The group maintains good links with bodies in other parts of the caravan industry, such as the National Caravan Council and the British Holiday and Home Parks Association as well as with the various regulatory authorities. Fuel duty is a major bugbear, too, not that it would seem so, given the lightness of their cargo but caravan hauliers use just as much fuel as any transport company making full use of their payload. The reason is drag. There are, therefore, a huge number of factors and variables that Rory has to take into account to make a success if his business. He has had plenty of experience, 20 years of it, this year in fact. Hi-Line has developed over the years and now includes a broad customer base of dealerships, manufacturers and leisure groups as well as many sites and private customers, all of which provide the stability required for a growing business. Originally published in May 2003. Some changes in the industry since the publication date mean that we now provide "private escorts" instead of Police escorts. We are now recovering from the "Credit Crunch" and more people are enjoying holidays at home, as in 2003. The RHA Secretary is now Nick Deal and Hi-Line Transport is 25 Years old this year.